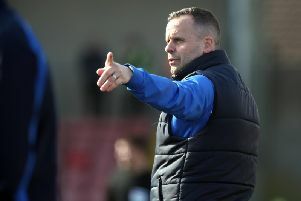 Stephen Baxter’s Crusaders on Tuesday night sent out a chilling message of intent by producing a demolition job on Ballymena United in the final of the Toals County Antrim Shield at the Warden Street Showgrounds. The high flying Shore Road boys are now unbeaten in 22 games in all competitions and, on this form, few would bet against them going on to complete a clean sweep of trophies! They current sit proudly at the top of the Irish League table while the hungry Crues have some unfinished business in the League Cup and Irish Cup. They are also due to travel to Scotland next month for an Irn Bru Challenge Cup showdown against Inverness Caledonian Thistle. United approached the final boasting a proud unbeaten 13 game unbeaten run, but that was shattered in a devastating first half. Quick-fire first half goals from Howard Beverland, Jordan Owens and Declan Caddell sucked the life out of David Jeffrey’s side. Indeed, had it been a boxing match, the referee could well have stopped it after 23 minutes – the Crues had three in the bag by that stage. United did show a token response in the second half, with goals from Johnny McMurray and Cathair Friel, sandwiched in between a strike from Paul Heatley, but they were totally outclassed all over the park. The Crues required a mere nine minutes for forge in front, courtesy of some generous defending. Paul Heatley’s corner kick was met by Beverland, whose initial effort was block, but the defender quickly followed up to stab home. The visiting fans were celebrating again 60 seconds later after another calamity in the home defence. Matthew Shevlin’s wayward pass was gobbled up by Heatley, whose low cross was rammed home by the boot of towering Owens. It was relentless stuff. Whyte then whipped in a free kick that was met by Beverland, but his flick header flashed inches wide. But it was game set and match on 23. Beverland’s long punt through the middle was brilliantly plucked out of the air by Caddell and his left foot volley fizzed in the bottom corner – simply devastating. Kevin Braniff then missed a glorious chance of throwing Jeffrey’s team a lifeline nine minutes before the interval. Tony Kane’s cross was helped on by Kyle Owens and, with the goal at his mercy, the former Glenavon man humped his shot over the top from only four yards. Big Owens thought he had grabbed his second goal of the night just two minutes after the interval, converting from close range, but referee Andrew Davey had spotted the striker had strayed offside. Against all the odds United gave their fans something to cheer on 55 minutes when McMurray latched on to a Kyle Owens flick, to blast low and hard past Brian Jensen. United should have scored again on 66 minutes. Kofi Balmer’s hoof through the middle was missed by Beverland, leaving Braniff with a clear sight at goal, but Jensen pulled of a magnificent save. They were made to rue that missed chance as the Crues were out of sight again three minutes later. Owens and Snoddy combined to set up Heatley and he picked his spot in the bottom corner. United were gifted a late consolation five minutes from time when Friel was left free to tap in. BALLYMENA UNITED: Glendinning, Kane, Owens, McAlorum, Braniff, Faulkner (McKinney 76), Shevlin (McCloskey 83), Balmer, Ervin, McCullough, McMurray (Friel 76). CRUSADERS: Jensen, Burns (Glackin), McChrystal, Beverland, Lowry, Ward, Caddell, Owens, Snoddy, Heatley (Cushley 84), Whyte (Forsythe 73).